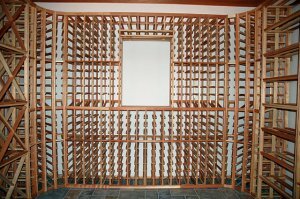 "Thanks so much for your help in the design and ordering of racks for our cellar. I thought you might enjoy a few pictures. You may notice I did a little custom work - not much really. I was able to use the extra 'center ladders' in place of the 'end ladders' on the corner racks and the tasting table. This made it fit with no modifications and gave an unbroken look to the racking. I am a very happy and satisfied customer!"